Retrieving Trial Champion Reveirter Cup Makybediva - Diva, was born on November 1 2005. Diva and her litter mates were born on Melbourne Cup Day and as we were driving to the vets with the puppies Makybediva’s retirement from racing was announced – hence our Makybediva. From an early age Diva’s desire to retrieve could not be questioned but her focus to do as asked left a lot to be desired. It took Diva three years of trialling to learn that retrieving is a team game and the handler is there to assist with the retrieve and not do everything on her own. 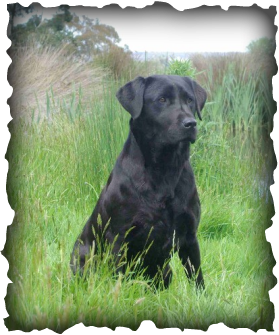 Diva’s trialling career commenced on 15 September 2007 at the Gundog Club of Tasmania, retrieving trial at Georgetown. Diva won the Novice Stake at her first outing in a trial. Diva also competed in and won the Restricted Stake on the following day the 16 September 2007 to give her the title of Novice Retrieving Dog. Diva’s Restricted career lasted a total of five Restricted Stakes winning the last on 25 May 2008 to give her the title of Restricted Retrieving Dog. Diva’s career in All Age has been much less successful. The first eight all age trials Diva competed in she failed to finish. Diva was now running her own race thinking she knew best and did not want to listen to her handler. It hasn’t been until a little bit of maturity that Diva’s results have slowly started to improve. Her first placing in All Age was a third at the Golden Retriever Club of South Australia Trial on 21 June 2009. It took another twelve months and a lot of heartache for Diva to win her first All Age Stake at the Retrieving and Field Trials Club of South Australia Trial at meadows on 23 May 2010. Diva’s last 11 starts in All Age Stakes for Kate and Noel has resulted in her completing 8 of the stakes. When Diva is in team mode she is a lovely dog to work with and her results reflected the team work with Noel. Diva eventually gained her Retrieving Trial Champion title by winning an All Age at the Golden retriever Club of South Australia trial conducted at Woodchester on 25 June 2011.